A spherical luminaire with an effective light distribution for large area amenity applications. 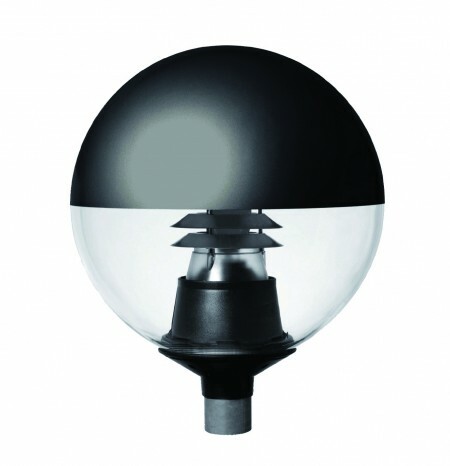 The Sphere Lantern is designed with elegance in mind, this sleek lamp will set you out from the crowd and with full IP65 housing, easy access to lamp, and an effective control of overspil, this makes it an excellent product for applications such as shopping precints, retail parks, and car parks plus many more. Clear polycarbonate sphere with coated upper canopy for effective control of upward light. (Black). Aluminium louvre provides a controlled distribution pattern and minimises glare. Optional 180 degree spill shield for effective control of overspill. Optics and control gear sealed to IP65. Easy access to lamp and gear via removing bowl. Typical mounting height of 5m to 6m.